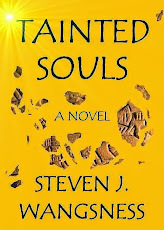 Glynis Smy is featuring Tainted Souls on her website, New Book Blogger. Stop by her blog and take a look around. Feel free to leave a positive comment if you liked Tainted Souls. That's a provocative title, but what I really mean is, is it acceptable for me, a middle-class white guy, to write a book narrated by a black man? Making the question more complex, this is not a contemporary black person, even, but an ex-slave living in the latter quarter of the 19th century. Obviously, I've never experienced slavery or Jim Crow. I've lived in places (Antigua, Jamaica) where I was a member of a racial minority -- but a privileged racial minority, one that was confident and even had a certain sense of entitlement. On the one hand, the answer seems readily apparent -- yes. Why not? In fact, race and status play little part in the narrative; it's just a convenient device to use to tell the story. The novel has little to do with race or slavery except as they relate to loyalty, in this case that of the narrator to his friend and former nominal master. The answer might be different if race and the experience of oppression were central to the story, but even then, would it be wrong of me to write in that persona or merely ill-advised? After all, if I can write only about characters I understand from personal experience, I'm going to be limited to white guys, and a pretty narrow circle of white guys at that. I've known a lot of women in my life and lived with a few of them, so does that make it OK to write a book with female protagonist? Even though I don't think I know what makes women tick? For some random reason, most of my best and better friends in life have been Jews (of the not terribly religious kind) and Catholics (of the failed kind), even though I am neither. So am I OK to write in the voice of a Reform Jew but not an Orthodox one? Of a Catholic who hasn't been to confession in 20 years but not one who goes to mass every week? My answer is that I should be able to write in any of these voices, as long as I'm confident that I can pull it off fairly, with diligence, research and respect. But I can see the other side of the argument: that you can't write about it seriously if you haven't lived it. Now, I resisted Facebook for a long time. This is just part of my personality. If everybody starts doing something, I want to do the opposite. If everybody starts wearing bell-bottom jeans again, I’ll start buying boot-cuts. If sailing becomes the rage, I’ll buy a powerboat. I haven’t always been like this. When I was younger, I desperately wanted to be popular, even as I put up a public face of indifference. I’m a lot older now and for the most part, my I-don’t-give-a-damn attitude is genuine. But everyone agrees if you publish a book, you gotta have a website and do all that social media stuff, so when I decided to throw Tainted Souls out there into Kindlespace, I caved and hooked up with FB. I find it surprisingly hard to navigate. Oh, it’s easy enough to check your news feed and see what weird stories your friends have shared with you. But just flipping around between my profile and the other parts seems inordinately strange, plus it’s hard to delete some stuff if you make a mistake, plus…well, in sum, it just seems to me in general more difficult to use and more limited than the product of a megamegabillion-dollar company ought to be. I should probably note here that I basically hate all these internet companies that have lavished riches on others – principally because it’s others upon whom all the riches have been lavished. I hate Microsoft – enemy of the people – for many reasons, but among them is the fact that the pre-IPO Microsoft once turned me down for an editing job, claiming I was “overqualified” for the position. (This HR philosophy may explain why Internet Explorer, now in its ninth frakking version for heaven’s sake, continues to crash all the time.) I could be sitting on a beach sipping daiquiris. But I digress. I’ve been trying to set up a separate FB page for a Tainted Souls “tour” I’m planning and have found the whole process decidedly aggravating. I don’t get this whole timeline format and it seems stupid to employ it for a product. To see how the page looks to everyone else, I’ve gotta log on as a fake user. Plus I can’t move stuff around. Blogger is, by comparison, user-friendly. (Is that still a word?) The whole thing has been a nightmare. All I’m trying to do is figure out a way to let people know there actually is a book called Tainted Souls available, but I’m a slave to Zuckerberg’s monstrosity. And inept at the task. Once again, just as in high school, I’m not one of the cool kids.